Distillers’ Dried Grains with Solubles (DDGS) could benefit Canada’s agricultural sector and the struggling manufacturing industry alike, all while reducing their environmental impact, says Dr. Amar Mohanty, a plant agriculture researcher at the University of Guelph. Mohanty is working with Dr. Manjusri Misra, School of Engineering, to create biodegradable, compostable plastics and green composites. They’re blending DDGS – a co-product of corn-ethanol production – with bioplastic pellets made from corn starch. The resulting green composite materials can be used to create anything from auto parts and partition walls, to plastic food-packaging trays and computer keyboards. North America produces an estimated 100 billion pounds of DDGS annually. At this volume, it’s beneficial to use these co-products in value-added, greener industrial applications, says Mohanty. “By using DDGS to create new biomaterials in the manufacturing industry, we’re creating added-value uses and reducing the environmental impact enormously,” he says. 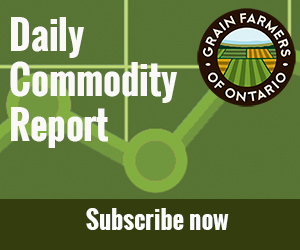 Over the past few decades, Ontario corn has averaged annual yield increases of two percent. But increases in soybean yields have been more modest – only 0.5 to 0.8 percent annually. University of Guelph researchers are looking to China – where the soybean originated – for new higher-yielding varieties to increase yields and the genetic diversity of soybeans in Ontario. For the past five years, Rajcan, his students and colleagues from the Plant Agriculture department have been introducing genetic material from high-yielding Chinese varieties stemming from the Heilongjiang and Jilin provinces in China, into their Ontario breeding material. The crossbred varieties developed so far have shown significant yield improvements. However, Rajcan says it may be another five years before any of the new varieties with the genetic diversity from China make it to Ontario markets. Consumers could also reap the benefits from the Chinese varieties that possess other important agronomic traits, such as high oil and protein content, disease resistance and nutraceutical traits. Fusarium head blight (FHB) – a serious fungal disease- is the number one concern for wheat farmers in Ontario. To fight back, researchers are developing more resistant wheat strains and effective fungicide treatments. The disease thrives in humid climates, and since Ontario has such variable weather every year, this research can effectively divert disaster in regions that would be susceptible to FHB. On top of resistant lines and treatments, the researchers are developing near-infrared screenings for toxins, which is a faster, cheaper and less destructive method than the current chemical screening process.